Charles Eastlake studied in London under Benjamin Haydon. In 1815 he went to Paris to study the paintings in France, but when Napoleon came back he left. When Napoleon after his fall was brought to Plymouth he was in a boat near the Bellephoron and quickly sketched the former emperor. From 1816 to 1830 he lived in Italy. In 1849 he married Elizabeth Rigby, author of books on art and of biographies. In 1850 he became president of the Royal Academy and in 1855 he was the very first director of the National Gallery. Eastlake died in Italy and was buried in Florence. The Royal Academy requested his body to be moved to England, but his widow didn't want a state funeral at St. Paul's Cathedral, because it was 'not consonant with his wishes'. He was subsequently buried at Kensal Green Cemetery, London. 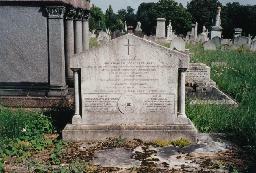 The grave of Charles and Elizabeth Eastlake at Kensal Green Cemetery, London.